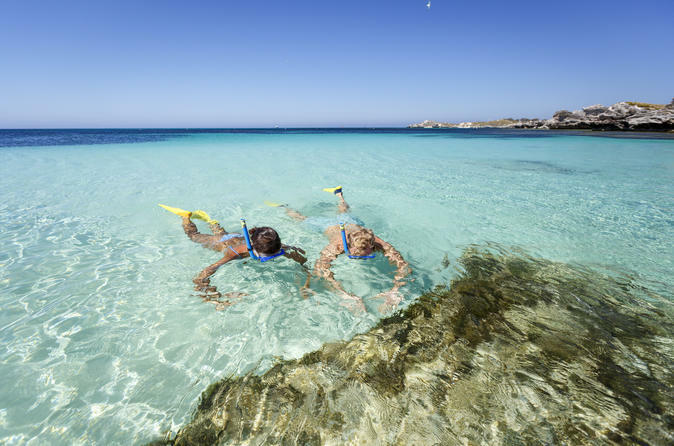 Located just offshore in the Indian Ocean, Rottnest Island is the favorite local getaway of Perth residents. On this day trip, travel to Rottnest by high-speed ferry from either Perth or Fremantle (your choice). Free time in the morning to relax and explore on your own or join a 20-minute guided walking tour of Thompson Bay. In the afternoon you will board your high-powered vessel to cruise to one of the island’s pristine bays for your 1.5-hour snorkel tour. Spot marine life such as parrot fish, herring, stingrays, octopus, eagle rays, moon tale wrasse and many more. Upgrade to a delicious lunch at the Karma Restaurant. Your Rottnest Island day trip starts in either Perth or Fremantle, depending on option selected when booking. From Perth, cruise down the Swan River on the ferry, taking in views of the upscale homes and yacht clubs that line the shore. When you get to Fremantle, where the river meets the Indian Ocean, pick up more passengers for the trip across the sea to Rotto, as the island is known to locals. When you arrive, explore the island independently. You may join a free 20-minute guided walking tour around Thompson Bay, the main township on the island, or check out the sights on your own. If you select the lunch upgrade option when booking, make your way to the Karma Rottnest at the specified time to enjoy a selection of hot dishes, salads, deli items, dessert and beverages from the buffet. Then meet up for your 1.5-hour snorkeling tour, which starts at 1:30pm. Grab your provided equipment and take off by boat to one of Rottnest’s many turquoise bays; depending on the weather and sea conditions. Spend about 60 minutes snorkeling, admiring the underwater world of coral and fish, such as harlequin fish, West Australian pearl perch, leatherjacket, baldchin groper, butterfly fish and moon wrasse. You may also spot crustaceans like the blue manna or Western rock lobster. When your snorkeling cruise ends, return to the main jetty for more free time to hang out on the beach or visit local shops before catching the ferry back to Fremantle or Perth.